This view of Mercury is made up of hundreds of images taken by NASA's MESSENGER spacecraft during its first flyby of the planet in 2008. New data suggest that Mercury, the closest planet to the sun, completes a rotation on its axis 9 seconds more quickly than previously thought. Mercury is a spinning faster than scientists had thought: New research shows that the planet completes a rotation on its axis roughly 9 seconds more quickly than scientists previously charted — and that data will help scientists understand more about the planet's molten core. 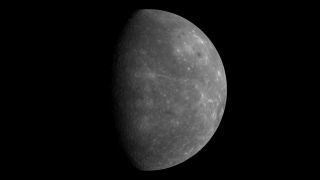 Mercury is a rocky planet only slightly larger than Earth's moon. Based on the data collected from NASA's MESSENGER spacecraft, scientists think most of Mercury contains a molten core that takes up 70 percent of the planet's mass. The newly measured rotation rate can be used to help calculate the proportions of solid and liquid within, even as researchers begin to understand its cause. Mercury is the closest planet to the sun. Because of tidal forces exerted by the star's gravity, Mercury has a 59-day rotation period that represents a 3:2 ratio with its 88-day orbit around the sun — for every three times it rotates, it orbits the sun twice. This ratio is unique among planets in the solar system. MESSENGER (Mercury Surface, Space Environment, Geochemistry and Ranging) was the first orbital mission around Mercury; after flying by the planet a couple of times, it remained there taking measurements between 2011 and 2015. While it was there, MESSENGER was also the first spacecraft to detect slight irregularities as Mercury moved around its orbit. By measuring the irregularities, scientists can deduce the size and density of the core, as well as map the planet more accurately. MESSENGER measured the altitude of the surface by timing the reflection of laser pulses off of the planet. These data were then compared with terrain models based on photos taken by the spacecraft. In addition to providing more information about Mercury's core, the rotation speed allows researchers to make highly accurate maps of the planet's surface — which officials say will help with future missions to Mercury. In 2017, the European Space Agency plans to launch the BepiColombo mission to further examine the planet's surface and internal structure. Follow Elizabeth Howell @howellspace, or Space.com @Spacedotcom. We're also on Facebook and Google+. Original article on Space.com .